We're introducing a new podcast series that focuses on quick and timely reporting on important climate news and information. We will emphasize stories that relate to the southwest, but we'll also include other climate related news that illustrate the impact of climate on national or global scales. And Mike, Zack, and Ben will still take a deeper look at southwestern climate issues in the monthly CLIMAS Southwest Climate Podcast. This episode, we're focused on record warm temperatures, drought, and snowpack across the west, along with a few stories that illustrate the downstream impact of these conditions. Globally, 2014 was the warmest year on record. This pattern was repeated in the southwest, where Arizona, California, and Nevada all had record warm average temperatures in 2014, while New Mexico, Utah, Idaho, Washington, and Oregon were all in the top 5 of warmest years on record (Fig. 1). 2015 is continuing this trend, where the January – March 2015 saw record warm average temperatures for 7 states, Arizona, California, Nevada, Utah, Wyoming, Washington and Oregon, while Montana, Idaho, Colorado and New Mexico were all in the top 10 warmest on record(Fig. 2). 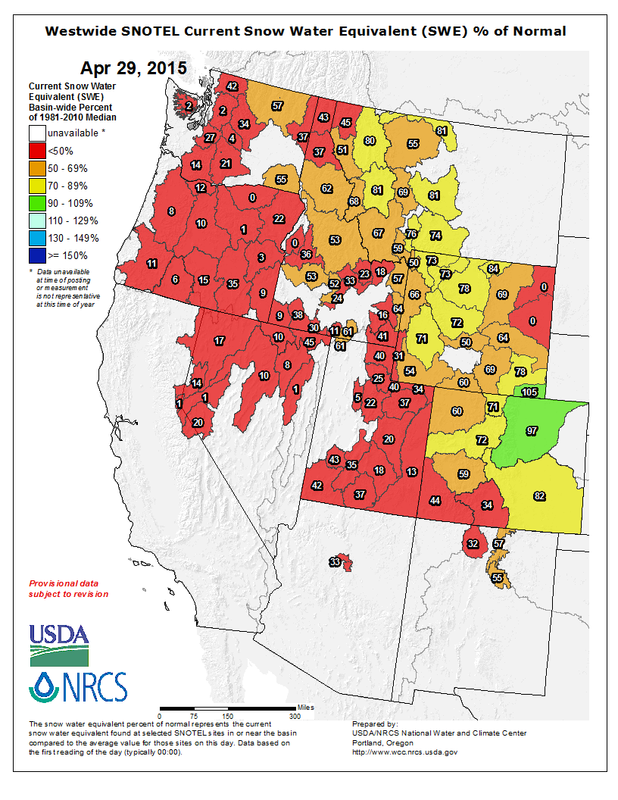 Besides concerns about a gradually warming climate, these record warm temperatures, along with below average water-year precipitation across much of the west, have resulted in far below average snowpack levels (see below) which is cause for concern regarding drought and water storage looking into 2015. 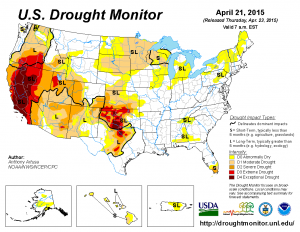 The current drought is ongoing and long term. It is especially severe in California, but it is still affecting most of the west and portions of Midwest (Fig. 3). 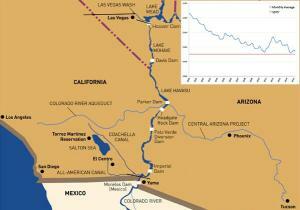 In Arizona the drought is leading AZ to think about Water Planning. Arizonan’s should not expect the same drastic steps that were taken in California in early April to preserve water. 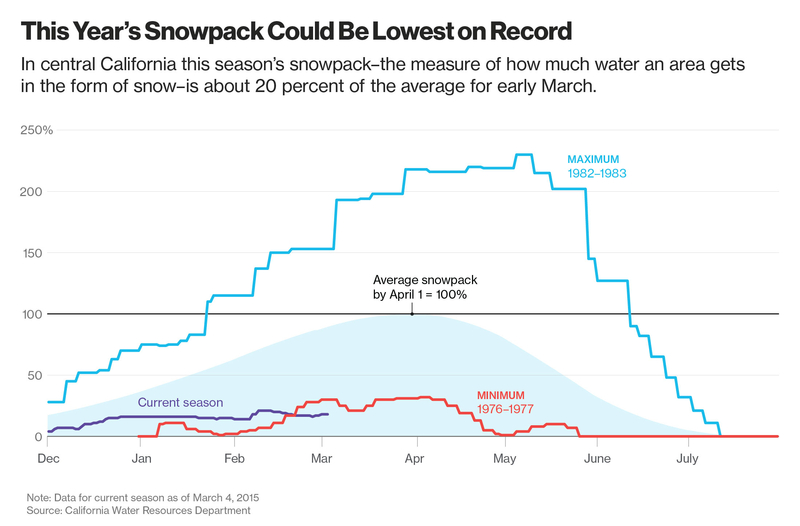 Arizona and California don’t get water from the same supply, and much of California’s problems stem from the lack of snow in northern California, along with increasing demand from both agricultural and municipal users. Both states do get water from the Colorado River (Fig. 4), but as of yet, neither has seen mandatory reductions, although water managers are closely monitoring Lake Mead with projections it might drop to 1075’ within the next few years (Fig. 4 inset) – which would trigger mandatory reductions in some allocations. Arizona water leaders are concerned about the drought, but they have been planning for possible shortages for decades. Drought and warmer temps aren’t the only things that come with climate change. These changes also alter the ecosystem dynamics as plants and animals respond to climate stressors. 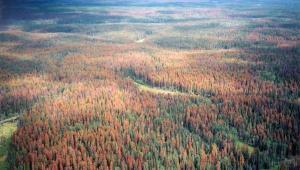 Bark Beetles are tiny winged beetles that have been attacking North American forests for a long time. But lately these beetles have gone into overtime and are attacking trees that are stressed by climate change (Fig. 5). Trees that were “born” during mini-ice age in 1800s are stressed by warming trends and the beetles are exploiting the reduced defenses associated with this stress. 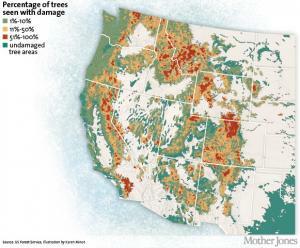 They are sometimes felling as many as 100,000 trees a day. Other genetic sub-populations that are more adapted to warmer temperatures are more resilient and the beetles don’t hit them as hard (or at all). Because of droughts and shorter winters, the trees are more stressed, and fewer beetles are killed off in winter freezes, and bark beetles have killed billions of trees in what will probably be the largest forest insect outbreak ever. 10 times the size of any past outbreak. Some real estate agents have seen the prices of home plummet from “viewshed contamination” in areas destroyed by the bugs (Fig. 6). As climate change continues to warm the forests in North America, these bugs are expected to continue to thrive. This means more beetles in the future, preying on bigger chunks of forested areas across the county. 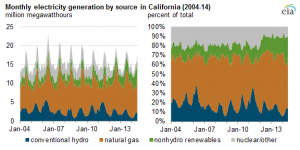 Record low snowpack plus the drought have led to California enacting restrictions on water. 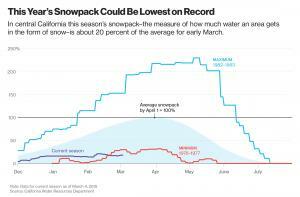 A statewide snow survey found that the water content of California’s snowpack was only 5 percent of the April 1st average. This is by far the lowest reading for that date. The previous record lowest snowpack for April 1st was 25 percent of average in records dating back to 1950. This survey on the Sierra snowpack at the Phillips Station was performed on grass for the first time ever. 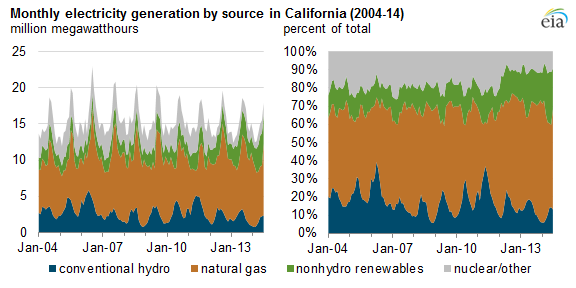 About 1/3 of California’s drinking water comes from the Sierra snowpack. So on April 1st California Gov. Jerry Brown announced mandatory statewide water restrictions for the first time in state history. One way to understand this snow deficit is to look at Tahoe City, California. From October 1, 2014 through March 31st 2015 only 19.5 inches of snow had fallen. That is 143.1 inches below average. Almost 12 feet less of snow! An airborne snow survey was conducted by NASA’s Jet propulsion Laboratory over the Tuolumne River Basin on March 25th and the snowpack water content is 34 billion gallons less than last spring. California has had a wetter April but as is the case with the drought across the western united stats - to make a dent in a multiyear drought, it requires multiple years of above average precipitation. Warmer temperatures, combined with a wet fall have resulted in a very heavy pollen season this year. Pollen grains are used by plants for fertilization and reproduction. but for humans pollen isn’t so nice. It can cause respiratory problems like hay fever and asthma. These allergic triggers come from the pollen made by trees, weeds and grasses. As temperatures rise and we experience changes in precipitation the growth and distribution of pollen is being affected worldwide. According to the National Climate Assessment and other recent publication, warmer air temperatures and more frost-free days have advanced the start time of pollen production. This is leading to an earlier and longer pollen season. Also because the levels of CO2 have increased, this has enhanced photosynthesis making pollen-producing plants bigger. Bigger plants, more pollen, more allergies. Warming temperatures have changed the spatial distribution of pollen. Ragweed, a rare type of pollen for the United Kingdom, was reported at record levels for the first time in the East Midlands in September of 2014. In 2001 7.3 percent of the U.S. suffered from asthma. In 2010 the number rose to 8.4 percent. The scientific community believes climate change could be contributing to this change.